Didn't find what you're looking for? 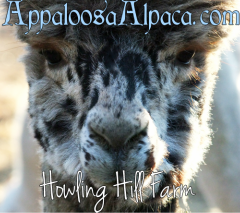 We encourage you to browse our farm's other available alpacas, as we very often make females available who have been bred for a Harlequin Appaloosa cria -- at very attractive pricing. We also offer our maidens available for sale with breedings to any of our herdsires, including our Harlequin Appaloosa males. Lastly, we welcome you to email us to get on our waiting list -- with no obligation -- for Harlequin Appaloosa cria. This little filly is the first cria born on our farm by our light harlequin appaloosa herdsire, Mr. Butterscotch. She is a true appaloosa, and wowie, was I excited when this one came around! Jessica Rabbit (so named for the pattern on her lips, which looks an awful lot like lipstick) is a spectacular little appy. She is straight and strong, with a dense, bright, well-organized fleece. Her conformation is perfect, and she has her sire's head with beautiful breed type. She looks like she will take after her dam and her aunt (light harlequin appy Candlelight's Cookies and Cream, full sister to Mr. Butterscotch, who is a very big girl) and will most likely mature to be a very big girl. At 10 months of age, she is already the size of some of our more compact breeding girls. Jessica sports good density, and she is starting to develop a very nice, high-frequency crimp with good brightness. We had an outstanding cria year this year, and with two harlequin girls and three tuxedo girls that are being retained, I have made the decision to offer Jessica for sale. Her purchase price includes her maiden breeding to any of our herdsires. My recommendation would be Que Sera's Kubota, an elite appaloosa who is closed to outside breedings, for a chance at a homozygous appaloosa. Please feel free to email us for more information about Jessica Rabbit, or better yet, to schedule a visit to meet her and the rest of our elite Harlequin Appaloosa alpaca herd. Meet Francesca Fiore. I went completely nuts when this one was born ... Can you blame me? Her dam, Snowmass Matrix Chasqui (daughter of, needless to say, Snowmass Matrix) delivered in the afternoon, and produced exactly what I had not even dared hope for: a harlequin appaloosa daughter. She was born fawn, with just a few black spots on her belly, but with our Harlequin boy Mr. Butterscotch as her sire, I knew what those spots meant. Francesca is a tall, elegant girl with huge amounts of energy. She has perfect conformation, a beautiful head, and fine, dense fleece. Her shearing day transformation was quite dramatic, as her blanket went from spotless medium fawn to a beautiful gunmetal grey with a faint merle pattern. I'm probably crazy to price this girl at all, but with 50+ cria expected in 2017, and given that Francesca looks as though she may mature to be just a bit taller than what we are breeding for, I've put a price tag on her. At the same time, I'm more than happy to keep her. There aren't a whole lot of Harlequin Appaloosa Matrix granddaughters out there -- if any? -- and this gal is one outstanding example of the Harlequin's potential. Please feel free to email us for more information about Francesca Fiore, or better yet, to schedule a visit to meet her and the rest of our elite Harlequin Appaloosa alpaca herd. Ella is elegant ... Ella is gorgeous ... Ella is APPY! Specifically, Ella is a harlequin appaloosa -- one of the many beautiful, unique manifestations of the marvelous and uncommon harlequin gene. Ella is our first harlequin alpaca, and man, she is a GREAT one! Ella's dam, Stella Nova, is herself a harlequin grey. She gets the gene from her sire, Platinum Flashback, whose sire, Peruvian Platinum, is one of the most celebrated carriers of the harlequin gene. Ella's maternal half-sister, Skyeview Sassafrass, is a show-ring champion (and also a harlequin grey). Her sire, Skyeview Lion King, is a son of Royal Peruvian Eros, who did very well in the show ring -- most notably in the "Get of Sire" category, which, it could be argued, is the most important! Lion King's dam is a daughter of the great Acero Marka's Mr Know It All, imported from Hacienda Acero Marka in Bolivia. Ella's conformation absolutely cannot be faulted. She is arrow straight in her front and back legs, with solid bone, a short back with good spring of rib, and a wide chest. This is an athletic and capable conformation, and Ella takes full advantage -- she loves to run, leap and pronk! On top of this, she has lovely type with a sweet, lovable face and good coverage. Ella's fiber is dense, uniform, and possessed of a bold crimp and very good staple length. Her disposition is wonderful -- she loves people, and has become a friend to the younger female alpacas. Ella's first cria has arrived! He is showy and perfectly conformed, and his fleece is fantastic. Is he harlequin? Well ... He has one spot, anyway! He may change color, but for now, he is fawn. Ella has been bred to King of Diamonds, a probable pattern-gene carrier, in the hopes of producing a "loud" appaloosa for her next cria. Unfortunately, Ella's second cria didn't "get the memo" either about being Harlequin -- but he is a LOOKER! She has been bred back to King of Diamonds for 2017. He did sire a dramatic Harlequin this year, so it's just a matter of getting Ella to give up that Harlequin gene! Please feel free to email us for more information about Mozzarella, or better yet, to schedule a visit to meet her and the rest of our elite Harlequin Appaloosa alpaca herd. Looking for a rare opportunity to break into the Harlequin Appaloosa scene with a BIG splash? ... You just found it. Renegade is a very rare, very unique Harlequin Appaloosa junior herdsire with an awful lot to offer. He hails from one of the rarest, yet highest-quality, Harlequin bloodlines out there: the Amy Carter line. Amy Carter was the only breeding offspring of a Chilean import dam, and she is truly an impact female in the Harlequin Appaloosa Huacaya landscape. Her bloodline is notable not only because of its overall outstanding quality, but because of its prepotency for the Harlequin Appaloosa phenotype itself. Whereas many Harlequin Appaloosa lines tend to be "sneaky" -- the gene remaining hidden in the background for generations -- Amy Carter's descendents have a strong tendency to breed true. Such is the case with Renegade's sire, Paparazzi. Paparazzi is out of a true Appaloosa daughter of Amy Carter, AOA Chelsea, and his production record for Harlequin and Appaloosa has been quite good when bred correctly. (Harlequin breeders will recognize the importance of matching a Harlequin up with the proper coloring to achieve the desired result.) Not only has Paparazzi produced quite a number of Harlequins -- and a few Appaloosas -- and quite a number of champions, he has produced a couple of truly unique Harlequins ... And Renegade is one of them. When I first saw Renegade's photograph, I knew I HAD to have him. Born silver with dramatic spots all over his body and a wild, "Rorschach" pattern on his face, I had never seen another alpaca like him -- until I saw the photo of his 1/2 brother, Rio. So, two totally wild, unique Harlequins -- both by Paparazzi. That isn't all that Paparazzi did for his offspring, however. Renegade's fleece is not just a beautiful color -- it's a really, really nice fleece. He is fine (right around 20 AFD on both 1st and 2nd fleeces) and uniform with a CV <20 on his 2nd shearing. This, coupled with an outstanding brightness, gives his fleece a marvelous hand. His staple length is excellent and he has good density and a high-frequency, low-amplitude crimp style. These aren't traits that are unique to Renegade, though ... We own two of his paternal brothers, and all three have this same super-soft, super-bright, beautiful fleece. There is a reason that Paparazzi made champions. Renegade is the largest of his sibling group. His conformation is impeccable. He has excellent presence and a gorgeous head. In many ways, he is the best out of the three. Why, then, is Renegade even being priced? Well, the reality is that we do own two of his siblings, and neither of them is even remotely for sale. Renegade is a truly unique, incredible animal, and he deserves to be breeding. He will be breeding here, but, because of the competition on our farm, perhaps not as much as he should be. Here is a rare opportunity. Please feel free to email us for more information about Renegade, or better yet, to schedule a visit to meet him and the rest of our elite Harlequin Appaloosa alpaca herd.